Catherine Fisher specialises in complex dark, crowded stories with many twists, turns and betrayals. Incarceron and Sapphique were premium examples of her craft and are two of my favourite YA novels deserving of success. The Obsidian Mirror is in the same vein but a little harder to get into. The principal boy character, Jake is pretty unlikeable at the beginning and it being set in a Swiss school and about a boy wanting to be expelled by injuring another boy perhaps not the best start. The first chapter smacks of caricature – the real story begins at Chapter Two with the arrival of Sarah who can make herself invisible and finds her way to the spooky Wintercombe Abbey pursued by a huge wolf and a Replicant. There is a mental patient on the loose and she definitely fits the description of the girl. Wintercombe is the home of the famous explorer Oberon Venn – godfather to Jake (arriving that very day in disgrace from his school in the company of his overbearing drama teacher, Wharton). There is a huge cast list, a sinister wood that one must never go into, Replicants that stalk the Abbey and don’t forget the wolf. The Mirror in the title is a time portal that seems to be have been created at least four centuries ago, or even longer, found in a grave and ends up in the hands of an amateur scientist in London, John Harcourt Symmes, who manages to activate the device. Simultaneously it is in Wintercombe Abbey, where Oberon Venn, who now owns it, is desperate to make it work, to go back in time and safe his wife Leah before she is killed in road crash. Complicated? We are just getting started. Add a marmoset owned by Jake (illegally smuggled in via Heathrow) a girl called Rebecca who is mysteriously helpful when Jake and Wharton arrive in the village and the invisible Shee, who live in the woods and feared by locals. The whole tale of Obsidian Mirror is infused with melancholia and much like the astonishing Jonathan Strange and Mr Norrell by Susanna Clarke, which it resembles, leaves one overwhelmed with sadness whilst you read. This, I must quickly add is not a bad thing and demonstrates the power of the writer. 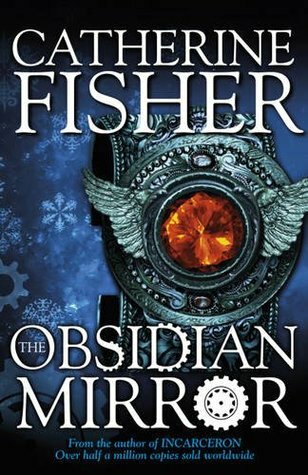 Nevertheless it can be claustrophobic, yet The Obsidian Mirror is an addictive read and one needs to be on your toes as to whom is telling the truth (if anyone) and what is really going on here. In a story where every character is selfish and obsessive and definitely not what they appear to be – trusting your instincts is hard. Rich in atmosphere, lush in description, this is just the first part of the story of the Chronoptika.